Douzo Meshiagare at Gardens by the Bay Bistro! 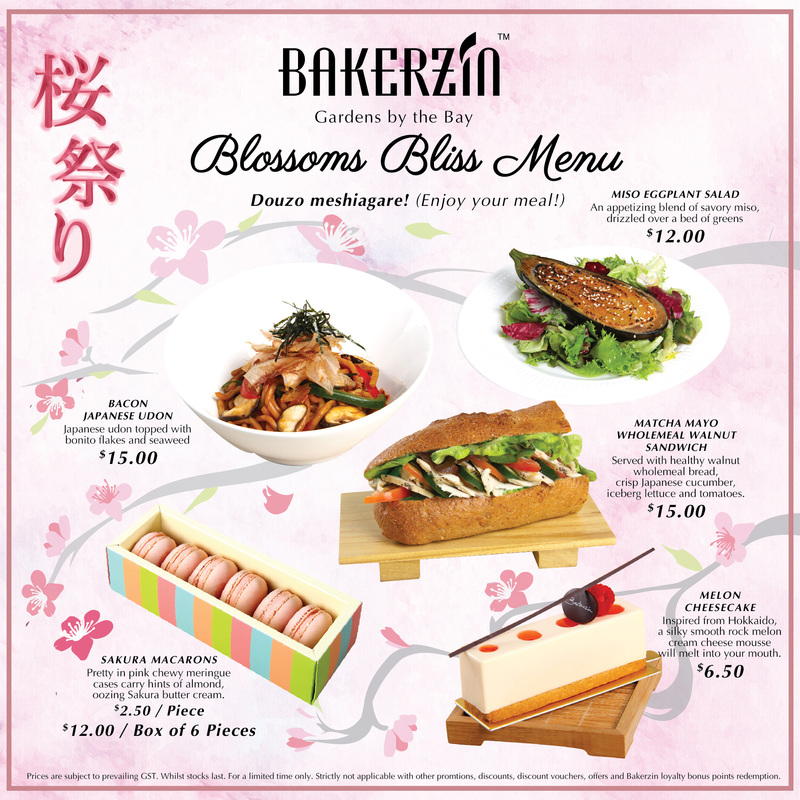 Friday | March 3, 2017	Complement the ethereal beauty of the blooming cherry blossoms with our specially created modern Japanese menu, available for a limited season in conjunction with Gardens by the Bay’s Blossom Bliss floral display. Douzo meshiagare! (Enjoy your meal!) The menu includes: •	Starter à Miso Eggplant Salad Tease your tastebuds with an appetizing blend of savory miso and sweet mirin, drizzled over a bed of greens and a plank of eggplant, grilled to a dreamy creamy texture. •	Mains à Bacon Japanese Udon Relish a delightful infusion of tastes and textures; the bacon, shiitake mushroom, red and green capsicum, ginger, onion and carrot are heartily stir-fired with umami dashi stock, sweet mirin, and savory Japanese soy sauce. Topped with bonito flakes and seaweed, this is one dish that’s truly oishii! OR •	Matcha Chicken Mayo Sandwich The timeless roast chicken sandwich gets a little pizzazz in our re-interpretation with rich Japanese matcha added to creamy mayonnaise. This light and refreshing sandwich is served with healthy walnut bread, crisp Japanese cucumber, iceberg lettuce and tomatoes. •	Dessert à Hokkaido Melon Cheesecake End your meal on a sweet note with a Bakerzin artisan dessert. Atop a buttery Sablé Breton base sits an exquisite and silky smooth rock melon cream cheese mousse that is wondrously light and thoroughly satisfying. Hop on down to Gardens by the Bay Bistro for a sumptuous treat!